Cisco-Eagle provides material handling solutions for the automotive industry at every level of the supply chain - manufacturing, distribution, and dealerships. For Tier One suppliers and manufacturers, we create handling systems that enhance the productivity of various operations. Often, this is in the order picking or assembly areas. 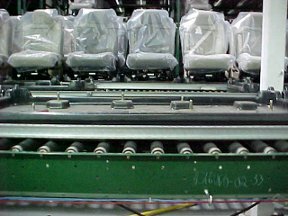 Our expertise aids companies in configuring assembly lines, pick areas, order fulfillment, and other vital manufacturing applications. 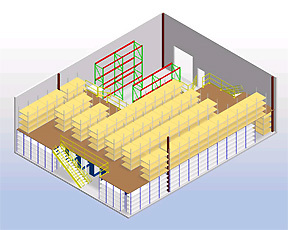 At the distribution level, we design and build world-class parts distribution facilities. Within the automotive parts industry, 250 to 300 lines are typically stocked, consisting of 70,000 to 80,000 part numbers. And the numbers swell every year as the market becomes more and more complex. 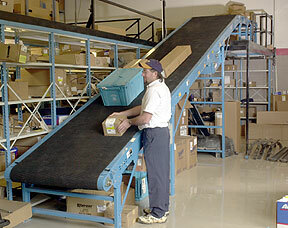 Storing and handling parts so that they're quickly accessible, easy to pick and safe from damage is a major objective. Facilities designed to function more productively become profit centers, rather than a cost of doing business. For parts distributors, Cisco-Eagle offers a range of solutions that make operations faster, less labor intensive, safer, more efficient, and more profitable. Ultimately, you become able to service your customers better and generate more profits because of it. At the dealer level, storage space matters. We create parts departments for dealerships that enhance productivity for parts pickers, mechanics, and customer service. Design and attention to detail are key in creating functional parts storage, and using the right storage solution to fit the way you work turns that key in your favor. For dealers who must store thousands of valuable small parts in a confined space, keeping everything securely and safely organized is vital. Dealer consolidated distribution centers are another important area where Cisco-Eagle expertise helps cut costs and boost efficiency. We recognize the unique storage and handling challenges automobile dealers, parts stores, and parts distributors face. From bulky bins for small components to bulk storage racks for tailpipes and bumpers, we're your best material handling resource.